AN INDIAN national was robbed by two men in Barangay 35, Bacolod City Friday morning, March 22. Police identified the victim as Ranjit Sigh, 42, of Barangay Villamonte. Chief Insp. 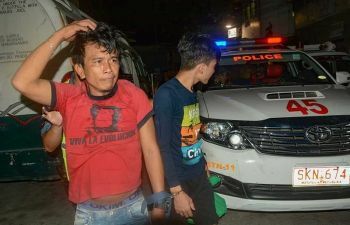 Jovil Sedel, head of Police Station 1, said the victim was collecting debt in the area at 9:45 a.m. when the two suspects identified as Michael Tugon, 32, and Philip Dellomo, 21, both residents of Barangay 35, allegedly threatened him at gunpoint and declared a hold-up. The alleged robbers carted away with a cellular phone worth P1,000 and cash amounting to P4,000. The suspects then fled, leaving Sigh unharmed. Sedel said Sigh identified the suspects through the station’s rogues’ gallery.